Salmon is a fatty, nutrient-rich fish that's low in mercury. This means that this extremely popular fish is a particularly healthy food choice. According to the American Heart Association, you should eat at least two 3.5-ounce servings of fish per week, and one of them should come from a fatty fish, like salmon. The general guideline is to eat two 3.5-ounces of fish a week. Salmon certainly makes a healthy choice, and you can enjoy it for both the recommended servings. According to the Dietary Guidelines for Americans and the Harvard T. H. Chan School of Public Health, most people should eat 8 ounces of fish each week. The American Heart Association recommends at least two 3.5 ounce servings per week. This isn't a strict amount — people can regularly consume between 6 and 12 ounces of seafood each week. The specific amount depends on the types of seafood you're consuming — you need to be careful not to consume too much mercury. Different types of seafood products contain varying amounts of mercury. Fortunately, salmon and other popularly consumed fish (like light tuna, pollock and catfish) are some of the healthiest types to consume as they have such low mercury content. However, out of the most popularly consumed fish in the United States, salmon has the most healthy fats. On average, Americans don't consume too much fish, even though you should eat fish or some type of seafood as a part of a balanced diet. Most Americans eat just 2.7 ounces per week (well under the recommended amount), which is roughly the size of a single serving of salmon. However, fish is a healthy source of protein and has unique nutrients not found in many other animal products. 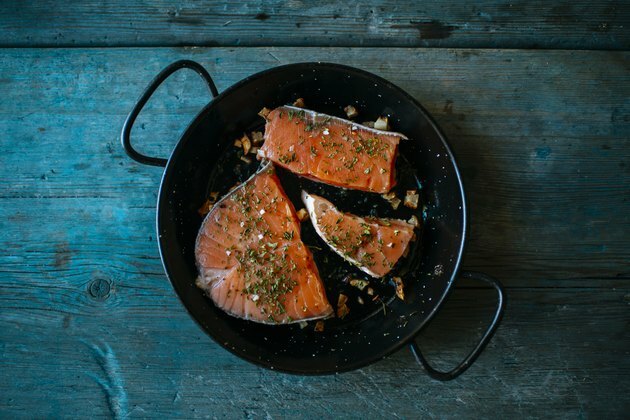 Regardless of how much fish you're choosing to consume, selecting fish like salmon will help you increase your levels of healthy omega fatty acids and various essential vitamins and minerals. Certain types of salmon, like wild-caught Baltic salmon, are also a good source of vitamin D3. You should be aware that the nutrients in fish can change, depending on whether they're wild or farmed. As one of the most popularly consumed fish around the world, many different species of salmon are commonly available from both farmed and wild sources. Although there are undoubtedly benefits associated with eating fish, it's important to remember to consume fish in moderation. There is, however, some debate about what constitutes a serving size. While the National Institutes of Health typically refers to a serving as 3 ounces, the American Heart Association calls a serving 3.5 ounces, and the FDA says a serving can range from 2 to 4 ounces. Understanding how much salmon you should actually consume in order to reap its benefits can be confusing. In general, the benefits of fish like salmon can be seen after consuming just 8 ounces per week. This is the equivalent of two or two and a half portions of salmon each week. Consuming up to 12 ounces per week is recommended for most adults, though this refers to your total seafood consumption (which should ideally come from various different sources). If you chose to consume all of this recommended amount as salmon, that would be the equivalent of about three or four portions. Consuming much more than this could be bad for your health. Salmon is a delicious food that's becoming increasingly easy to obtain worldwide. Whether you're eating sushi, blackened salmon or salmon fishcakes, it can be surprisingly easy to eat salmon regularly. Given the health benefits associated with fatty fish like salmon, you might even be tempted to consume this fish on a daily basis. According to an interview on Today with Eric Rimm, director of cardiovascular epidemiology and professor of epidemiology and nutrition at the Harvard T.H. Chan School of Public Health, most people eat fish daily without issue. However, while eating salmon every day over a short period of time could be healthy, excessive consumption of fish — even those that are low in mercury — could result in mercury buildup in your body. Too much mercury can result in mercury poisoning, which can lead to neurological defects. Whether these problems are temporary or permanent will depend on your age — which is why children and pregnant women should eat less than the standard recommended amount of fish and even avoid consuming certain fish altogether. While the average adult could be OK eating salmon every day, pregnant women and those who are breastfeeding should limit their consumption of fish to 8 to 12 ounces of seafood per week. They should also avoid certain high-mercury fish altogether and limit their amounts of fish like tuna. Since salmon is low in mercury, these 8 to 12 ounces could come from this fish without causing any health issues. Today: Eating Fish 2-3 Times a Week Is Recommended: What About Every Day? Harvard T.H. Chan School of Public Health: Is It Okay to Eat Fish Every Day? Journal of Nutrition: Quantitative Analysis of the Benefits and Risks of Consuming Farmed and Wild Salmon. Nutrition: Vitamin D: Can Fish Food-Based Solutions Be Used for Reduction of Vitamin D Deficiency In Poland? Harvard T. H. Chan School of Public Health: The Nutrition Source: Fish: Friend or Foe?